The Senegalese are sports-mad and very proud of their fitness and athleticism. As the heat of the day subsides, the sandy streets of St Louis are turned into makeshift basketball pitches! 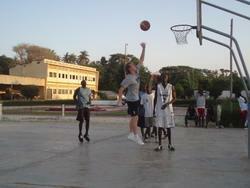 But Basketball in Senegal has had mixed fortunes of late. The 2006 World Basketball Championships were not a success for the Senegalese team and saw them finish in last place. However the national team is now under the professional management of one of the most prominent and powerful people in the world of African basketball, namely Amadou Gallo Fall. With his help the team won gold in the 2007 African Championships but came 7th in 2009. In the coming years with the help of our volunteer coaches, basketball in Senegal can hopefully develop further and give the country something else to be proud of! Our sport coaching programme in Senegal allows volunteers to coach basketball to children with a range of sporting talents. Projects Abroad are based in a number of different schools within St Louis, where basketball is high on the agenda in sport classes. Volunteers coaching basketball will work with children from about 8 to 16 years old. There are also a number of other sports volunteers can get involved in at the schools. The Sports project should be combined with some time on a Teaching or Care project, to make sure you have enough working hours. Please let us know which combination of projects you prefer when you apply. There are many natural attributes that can help a person when it comes to playing basketball, such as speed, strength and stamina, and these are all things that the typical Senegalese student possesses in abundance. But the untrained eye often misses the importance that strong tactics and teamwork can make to a game. This is where volunteer coaches can help to make the biggest impact. By introducing simple training methods you can bring together a team's raw talents and lay the foundations for their progression. Training consists of fitness sessions, accurate passing drills, 'man to man' and zonal-marking exercises, plus team structure and strategy sessions. Your exact role with depend on your experience; if you are able to take groups alone then that is fantastic, but you will be greatly appreciated even if you are only able to offer support to the professional coach. This project is available for two weeks if you don't have time to join us for a month or more. This project has been selected by our local colleagues as being suitable for short term volunteering for both the host community and the volunteer. Although you will gain a valuable cultural insight and work intensely within the local community, please be aware that you may not be able to make the same impact as someone volunteering for a longer period.